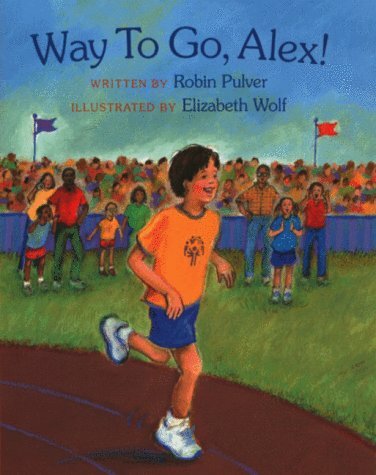 Title : Way to Go, Alex! Way to Go, Alex! gives all of us something to cheer about, helping children feel victorious before crossing a finish line. It is about a traditional suburban family with a mother, father, older brother, and younger sister. The story is told from the younger sister’s point of view, making it easy for young readers to identify with her. One thing that makes this family special is the older brother, Alex, goes to a special school because, as his sister explains, “his brain doesn’t work right.” Alex’s sister wants her brother to be able to win something that his family can celebrate. Alex’s parents register him for three events in the Special Olympics providing an opportunity for Alex and his sister to train together and share a joyful experience. The lesson learned by the young protagonist is a new definition of what it means to win. The oath of the Special Olympics is lesson learned by the young protagonist, “Let me win. But if I cannot win, let me be brave in the attempt.” This book normalizes the experience of having a sibling with a disability by using an honest, innocent voice of a younger sister. The author, Robin Pulver, is a local talent from Morton Grove, IL. She manages to balance frustration and love while providing insight into the family life of a child with a disability. The artwork has a childish style depicting the faces of the children with subtly blurred features. The children with Downs Syndrome are indistinguishable from any other child in the story while still being authentic enough to an insider. The illustrations are beautifully done using simplicity and expression. This book could be used to help build pride and acceptance among young readers whose lives are touched by someone with a disability or mental illness. It could be used in grades K through 6. It would be a valuable addition to any school library or classroom. Carly gets jealous of her best friend Annie bragging about her older brother Ryan's accomplishments. She begins to wish she could fix her older brother, Alex, by making his brain work right. Alex has mental retardation and struggles to do tasks that other children do. Carly keeps trying to change her brother until she experiences his participation in the Special Olympics. After helping Alex train and watching him complete in the Special Olympics, Carly realizes how wonderful her brother is and all that he has taught her about life. This book would be great for discussing differences. It also has a good message about working hard and trying your best.